Access a unique perspective on this spiritual classic in a way that will depict the priorities of your inner compass regarding those life issues that are central to your life. Interpretations spring up when people want to emphasize what they find particularly important and meaningful about a text. Often, people don’t realize they are doing this; instead they are sure that they are being true to the meaning of the source and presenting its real meaning. This points to the inevitability of multiple perspectives, something that enriches our knowledge of the Gita but can be confusing as well. For instance, you have Sri Aurobindo interpreting the “field of battle” as the world itself, which is a battleground for moral struggle, while a contemporary Sanskrit scholar, Fowler, views the field of battle as the eternal order that pervades the entire cosmos and the battlefield itself as the field of righteousness, on which the truth will eventually triumph over ignorance. While the Gita portrays the relationship between the Self (Arjuna) and a personal God Saguna Brahman (Krishna), who encourages desireless action, Shankara’s famous interpretation of the Gita sees liberation, moksha, as something which is not attained through any action, but realized, since oneness of Atman with Brahman is always already present. There is no one, simple, or reliable answer; Integral Deep Listening adds an approach to the discussion that you can explore for yourself. If you find it meaningful, you can apply it to all sorts of sources that beg for a clear, relevant interpretation: dreams, nightmares, synchronicities, mystical experiences, historical figures, near death experiences, or recurring life issues like dead-end relationships or addictions. Using the Gita as an example, here is how it works. Notice that whatever interpretations the author of the Gita had, he mostly presented those views from two very different perspectives, that of Arjuna and that of Krishna. We learn a great deal about both perspectives from the Gita; Arjuna is filled with doubt, anxiety, and fear at the thought of killing friends, relatives, and teachers. Let us hope so! Such a reaction would normally be called “moral,” and “ethical,” and a reflection of one of the cardinal principles of world-wide spirituality, to treat others as you would want to be treated. Arjuna is not concerned for his personal safety or the defense of his cause; he is in moral peril; if he acts he fears doing to his soul the type of damage we might associate with disorders like post-traumatic stress disorder and the high rate of suicide among veterans. Arjuna believes in transmigration; he is concerned about the long-term salvation of his soul. Krishna, on the other hand, represents a perspective that reveres dharma, or allegiance to cosmic order, as reflected in Arjuna knowing and following his vama, or duty as a warrior. Yet in an apparent contradiction, at the end of the Gita, Krishna says to abandon all dharma and simply surrender to him. Is the solution duty or devotion? The two merge in the Gita. From Krishna’s perspective, the dual conflicts of armies in battle and that within Arjuna’s mind regarding moral choice, are both samsara, desire-based attachment, and maya, illusion. Krishna councils both detached action and devotion to universal, eternal deity. This will lead to the abandonment of anger, lust, and greed and to the discernment that comes from the cultivation of a clear and centered mind. So here you, the reader, sit, with your own life issues, reading the Gita, puzzling over what to make of its words and which interpretation will take you where you want to go. You may settle on this answer, “All of them, in one way or another, because there is great value from studying the Gita, no matter which perspective I choose.” The author of the Gita is saying, “trust!” Trust Krishna! Trust your dharma! Trust karma yoga! Trust bhakti yoga! Trust jnana yoga! Trust your scriptures! Whether the author of the Gita is saying this or not, does your own, personal spiritual destiny boil down to trust? Integral Deep Listening remembers that yogas are fundamentally empirical. That means that they do three things. First, they provide instructions, or a “recipe” to follow that says, “In order to attain moksha, do these things in this order, in these amounts.” Secondly, you have to assemble the ingredients and follow the recipe. You have to follow the instructions and perform the yoga. It is not enough for you to form an opinion based on your interpretation of the instructions. You have to perform the experiment yourself if you desire knowledge, rather than hearsay, of the efficacy of the formula, instructions, or recipe. Third, you have to subject your results to others who have already performed the experiment successfully. Classically, this means to take your results to your guru. In science, it is peer review. Similarly, Integral Deep Listening is an empirical yoga. It says, “To wake up, interview emerging potentials that appear as characters in your dreams, personifications of your life issues, classical spiritual literature like the Gita, or world events, like the terrorists from 9/11.” They will make recommendations. Follow those that make sense to you. When you do, what happens? Does your life improve? Do those knowledgeable in Integral Deep Listening see you following the instructions correctly? What changes in your life do they see? For Integral Deep Listening, the interpretations that matter are both those of respected “experts” as well as those those of your inner compass. Since your inner compass has multiple facets, like a diamond, or the thousand bodies of Krishna in his Vishvarupa, or universal form, how do you determine which interpretation is best for you, even if you do manage to contact it? Aren’t you in the same dilemma as with the Gita, where you have to sort through not only the perspectives of Arjuna and Krishna and the author of the Gita, but the opinions of whatever interpreters you read? Which interpretations are true? More importantly, which is the truth you need right now, in the particular circumstances of your life? This is something that others really don’t know and can’t give you; this is something scripture and inspirational material can’t know and can’t give you. It isn’t fair to expect them to do so. At best you will stumble across an occasional “ah ha!” That is good, but is an “ah ha!” the same as finding and following your inner compass? How do you do that? In Integral Deep Listening you interview one or more perspective that is likely to provide you with the objectivity that you need to see where you are stuck and what you need to do today to get unstuck. You do so by imaginatively becoming this or that role and answering a series of questions that are designed to address who you are and what you need, from the perspective of your emerging potentials. You can tell if they are more awake or enlightened than you are – and therefore more attuned to your inner compass than you are – by how they score in six core qualities that are associated with enlightenment. These are fearless confidence, compassion, wisdom, acceptance, inner peace, and witnessing. Which perspective from within the Gita would you most like to learn more about? It is good to start by making a list of possibilities. There are the four characters in the Gita: Arjuna, Krishna, Sanjaya, counsellor of the Kuru king, and the Kuru king, Dhitarashtra. However, there are many other unnamed, unspoken characters, such as all the warriors on each side of the conflict, some of which are friends, relatives, or teachers of Arjuna. There are the two kingdoms that the warriors represent, including all their respective citizens. You could become such a group character and interview it. Beyond these, there are the non-human characters in the Gita, including the horses, chariot, and weapons. Yet beyond these are the characters that comprise the setting, which are largely unspoken but understood, including the ground, the sky, and the air. Which character to choose? Just as in understanding the Gita, you do not have to choose only one perspective; instead you can explore many and compare what you find. This is what is done in the precursor of the Integral Deep Listening interviewing process we demonstrate below. That precursor is called Dream Sociometry; it interviews five or six characters from a dream or life experience at the same time. If you want to learn more about it, here is the link: . For the following demonstration, we will choose the air. Notice that air is an unspoken but obviously present character in the Gita. It is different than sky, but it is co-extensive with the sky, in that the sky is made up of air, yet air is a more intimate and personal aspect of sky, in that air is what Arjuna, Krishna, and the others take into their bodies and exhale. Notice that the air not only transcends, yet includes all other characters in the Gita, but is also immanent. It is as much within as it is without, something not characteristic of sky. Notice also that while Krishna is in the Gita a personal expression of Brahman, of supreme deity, he is not only transcended and included by air; it is his prana; his life force. Therefore, hearing from air should be interesting. Will it be worthwhile? The only way for you to tell is to do such an interview yourself, either with air or with some other character from the Gita. My results, in the following interview, are not your results; they are not the truth of the Gita. They are not in competition with the author of the Gita or any of the innumerable talented and knowledgeable translators and interpreters of the Gita. The purpose of this interview is not to be historically, philosophically, or religiously accurate; it won’t be. If you judge the interview by those standards, it will fail. The purpose of interviewing Air in the Bhagavad Gita is to give an example of how you can access a unique perspective on a spiritual classic in a way that will depict the priorities of your inner compass regarding those life issues that are central to your life. Notice that the answers given by Air are not only my air. Its perspective includes, yet transcends, mine. That is because air, as a perspective generated by me, has the benefit (and limitations) of my life script, my language, my assumptions, and my interpretations. Notice also that it adds its perspective on top of that. We know that it adds a different perspective when it says things that I either don’t agree with or don’t understand. Therefore, although I am familiar with its perspective, because it has its origins within me, it is nevertheless autonomous in important ways, as we shall probably see. 1 Being more aware and careful; less mindless and thoughtless. 2 Staying on my diet and losing ten kilos! 3 Not second-guessing myself so much; having more confidence. The dream is a cultural and religious classic for all humanity: The Bhagavad Gita. The Gita raises important questions. Is conflict inevitable? If so, what are the best ways to resolve it, both between individuals and societies and within individuals? During the Vietnam war I wrote out grounds for conscientious objector’s status. 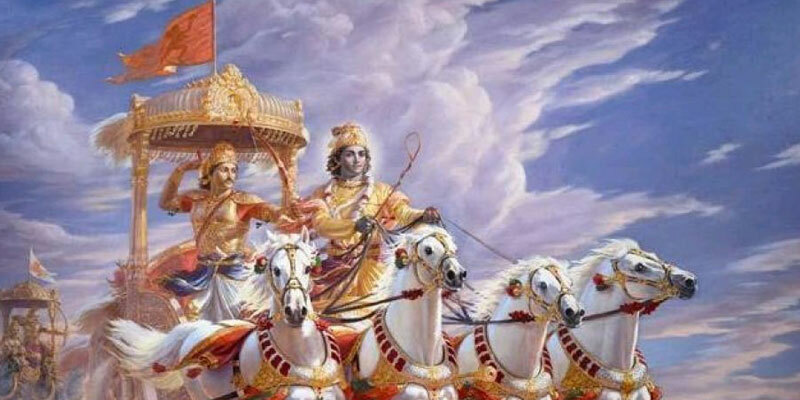 I was told by a minister that the Gita supported going to war. I knew that the Gita had inspired Indian independence and Gandhi, whom I greatly respected, yet Gandhi was a strong advocate for the Gita, but was nevertheless committed to non-violence and satyagraha. Additionally, I knew the Gita dealt with timeless issues that were not going to go away, and it presented multiple explanations for the meaning of life that people would return to, throughout history. Arjuna, Krishna, Sanjaya, counsellor of the Kuru king, and the Kuru king, Dhitarashtra, all the warriors on each side of the conflict, some of which are friends, relatives, or teachers of Arjuna. The two kingdoms that the warriors represent, including all their respective citizens. Horses, chariot, weapons, the ground, the sky, the air. There are certainly other characters I haven’t listed. Now remember how as a child you liked to pretend you were a teacher or a doctor? It’s easy and fun for you to imagine that you are this or that character in your dream and answer some questions I ask, saying the first thing that comes to your mind. If you wait too long to answer, that’s not the character answering – that’s YOU trying to figure out the right thing to say! Air, are you a character in Joseph’s dream? The Bhagavad Gita is humanity’s dream, and most particularly the dream of its author. But yes, as part of humanity, it is also Joseph’s dream. I don’t see; I experience. I experience the sky, of which I am a part. I experience the life force, or prana, which I contain; I experience the different gasses I also contain: nitrogen, carbon dioxide, oxygen, helium, hydrogen, and so forth. I experience myself being inhaled into Arjuna, Krishna, the two armies, and the horses. I experience myself bringing life, and being exhaled as carbon dioxide. Air, would you please tell me about yourself and what you are doing? I am alive, yet I am deathless. You can’t cut me or destroy me, although you can pollute me and change my composition. I am witnessing both the sky and my transformation by the breathing process by these people and animals. It is so normal and has been going on for so long that I normally don’t notice it. Air, what do you like most about yourself? What are your strengths? I like that anyone and everyone can take and use me in whatever way they need. I like that I get to be connected with everyone and everything. I like that I am touched and changed by life. I like that I give life. Air, what do you dislike most about yourself? Do you have weaknesses? What are they? I can’t think of anything I dislike about myself, nor am I aware of any weaknesses, although I am invisible and appear so “weak” as to be non-existent. Yet I am the source of life. Air, what aspect of Joseph do you represent or most closely personify? Air, if you could be anywhere you wanted to be and take any form you desired, would you change? If so, how? No. I am free; I can go wherever I want or wherever I am desired. Air, how would you score yourself 0-10, in each of the following six qualities: confidence, compassion, wisdom, acceptance, inner peace, and witnessing? Why? Confidence, 0-10. Why? 10 I can’t die; I have nothing to be afraid of. I am highly successful at being me. Compassion, 0-10. Why? 10 Others would probably say I am completely compassionate because I give myself selflessly to everyone and everything. However, compassion doesn’t cross my “mind”; it’s not part of my nature. I just do what I do. Wisdom, 0-10. Why? 10 I am aware in the sense that I have great knowingness that is unimpeded by language, opinions, or preferences. I have an intimate connection with life because I am life; I have the wisdom of life. Acceptance, 0-10. Why? 10 What is there not to accept? Death does not affect me; joy and happiness do not affect me; otherwise I would be fickle. I accept all things, all events, and I accept myself. Inner Peace, 0-10. Why? 10 Even when there are tornados and hurricanes I am at peace, because I am still me. Why should I be less me just because I am moving quickly and powerfully? My peace comes from knowing what I am and being what I am. Witnessing, 0-10. Why? 10 I am a part of, yet separate from, all things. Even rocks contain my elements! Air, how would Joseph’s life be different if he naturally scored like you do in all six of these qualities all the time? He would be in the world, of the world, affected by the world, yet grounded in an essential nature that was unaffected by the world, even as he was transformed by it. He would hear and respond to the concerns of others; he would empathize, he would care. However, thinking about the predicaments of others, what others are saying about him, or taking action to help, would not impact his basic nature. Air, if you could live Joseph’s life for him, how would you live it differently? He would not take either external or internal conflicts personally. He wouldn’t make them about him. Even his dream conflicts wouldn’t be about him. They would be among dream characters. Air, if you could live Joseph’s waking life for him today, would you handle Joseph’s three life issues differently? If so, how? 1 Being more aware and careful; less mindless and thoughtless. Mindlessness and thoughtlessness are symptoms of too much self awareness, too much personalization. It creates filters that keep him from being fully present. So it’s back to separating what’s happening from his basic nature and staying clear. 2 Staying on my diet and losing ten kilos! This would be easy if you took on my mind, my perspective, because I don’t eat! I don’t get hungry and I don’t make food choices based on emotions, preferences, or anything else, because I don’t eat! 3 Not second-guessing myself so much; having more confidence. Be me. I don’t second-guess myself at all; I am very good at simply being me and letting that be enough. Air, what life issues would you focus on if you were in charge of Joseph’s life? 1. Instead of breathing me in and out, I would have him be me breathing him. I would have him look at his life moment to moment from my perspective. This will objectify his physical sensations, emotions, images, and thoughts. Air, in what life situations would it be most beneficial for Joseph to imagine that he is you and act as you would? When he wants to score higher in one or more of the six core qualities. Air, do you do drama? Do you get into playing the Victim, Persecutor, or Rescuer? If not, why not? Air, What is your secret for staying out of drama? Air, you are imaginary. Why should Joseph pay attention to anything you say? Because I score higher than he does in core qualities associated with being awake. Air, why do you think that you are in Joseph’s life? He wanted to demonstrate how others could discover a new, authentic, personalized interpretation/perspective on the Bhagavad Gita. Air, how is Joseph most likely to ignore what you are saying to him? He most certainly will! There’s the inertia of his habitual thinking, feeling, and doing. There’s the absence of a pressing need to move him out of his stuckness. Air, what would you recommend that he do about that? When some pain or frustration comes along that doesn’t go away very easily, I’m here for him if he chooses to remember me and use me. Air, why do you think Joseph had this dream? To relativize the advice of Krishna; to show it may be universal, but that it is not immediately, personally applicable nearly as much as either I am or other interviewed emerging potentials are. He wanted to share this tool with people in a way that might make sense to them. Air, why do you think (some dream event happened) or (some character) was in the dream? Why do you think Krishna justifies killing? The author of the Bhagavad Gita wanted to support social stability by explaining how it was dharma to do your job, based on your birth. He also wanted to get the message across not to take conflict too seriously. To address it, yes, but not get personally wrapped up in it. I agree. But isn’t Krishna basically justifying abuse? Yes. But the doctrine of two truths is basic to Hinduism. There’s how things look from below and how they look from above. There’s how morality looks for a citizen and how morality looks for a government. It isn’t abuse from higher perspectives. That’s what the author of the Gita is saying. I don’t know that I buy that, Air. I’m not saying it’s right or wrong; I don’t care. It doesn’t affect me. You can agree or not. Air, why should Joseph pay any attention to what you have said? Aren’t these just a projection of Joseph’s own wishes and projections? As I said before, I score higher in core qualities of enlightenment than he does. The Air in the Gita isn’t interested in making the points Krishna makes. It seems much more passive, disconnected, and disinterested than Krishna. Air: I understand that I sound that way to you. It is true that I am more disinterested than Krishna. However, I am anything but passive. I am intimately invested in all aspects of life. I am anything but disconnected. So to confuse my disinterest with passivity and disconnectedness is a mistake. Becoming Air and taking its perspective will help me to become more present, more mindful, less mindless and inattentive. It didn’t say it, but I suspect I will feel more alive as well. I can become Air when I want to not be hungry. It claims that will help, since it doesn’t eat. If I am taking things personally I can become air; it’s supposed to help. Become air to become less mindless or thoughtless. When having self-doubt, become Air. How does one change this interview from philosophical speculation to a yoga? Find a partner or a support person, such as another person who you exchange interviews with or an IDL Practitioner. Exchange emails. Send a report each week on how you have done on applying your recommendations. Don’t worry about perfection; just focus on making a game out of doing better. 1) Make a list of the recommendations in the interview. 2) Choose the ones that you want to work on. 3) Make a weekly chart to track your application daily, before you go to sleep. (Write them in a way that change is measurable so that you can test the method. What will be done differently? When? 5) There will be some items you can check off if you’ve done them before you go to sleep. 7) Share your results weekly with someone to create accountability. Have fun! This is important because a basic principle of psychology is that you change whatever you focus your awareness on tends to change in the direction you want it to. You don’t change what you are unaware of, so simply listing and noting, without judgment, moves you toward your goal. This is how you test Integral Deep Listening. Does it bring lasting, positive changes to your life or not? If you only do a bit of this, no problem. You can come back to this format with successive interviews and over time, you will improve your ability to monitor your application of your recommendations. How is such a process likely to affect your understanding of the Gita? Krishna wants to educate and give all sorts of explanations and alternative approaches. Air does not. Krishna wants to come up with reasons and activities that make life conflict either acceptable or go away. Conflict doesn’t exist for Air. Therefore, its resolution is a non-issue for Air. Krishna is very invested in Arjuna becoming enlightened. Air doesn’t seem to care whether Arjuna or I become enlightened or not. Air does not put itself in the role of spiritual teacher or guru the way Krishna puts himself. Air, however, is very much a spiritual teacher and guru, but by what it is and the perspective that follows from its nature, much more than from what it says. This makes Air neither better nor worse than Krishna; it is merely a different perspective, assumed on the assumption that truth is not absolute but rather multiperspectival, with each perspective consistent within itself. The reasons for each question have been carefully thought out over more than twenty years. To learn more about the rationale behind each question and the protocol as a whole, see Integral Deep Listening Interviewing Techniques, by this author. For a workbook of tools for moksha basic to Integral Deep Listening, see Waking Up, by this author. Here is a summary of the basic concepts in Integral Deep Listening. These are explained . lost in the drama of your life issues. Stuck in the perceptual realities of your physical, mental, and emotional filters. You are here to wake up. luminosity, cosmic humor, and abundance. You are addicted to the past and the future. cosmic humor, abundance, and luminosity. _______ are you a character in ______’s dream? (Character), you are imaginary. Why should ____ pay attention to anything you say? (Character), why do you think ______ had this dream? (Character), why do you think (some dream event happened) or (some character) was in the dream? (Character), why should _____ pay any attention to what you have said? Aren’t these just a projection of ______’s own wishes and projections? This is important because we change what we are aware of. We don’t change what we’re not aware of. Simply increase your awareness of something and it will tend to change in the direction you want it to: increase or decrease. It’s also important because it’s the way you test IDL. Does it bring lasting, positive changes to your life or not? 6) Other items need to be rated on a zero to ten scale. How did you do? Rate yourself without criticism. 7) Make it into a game with a partner. Have fun!